I recall an old joke about people freezing to death at a drive-in theatre, while waiting in their car to see "Closed For The Winter". 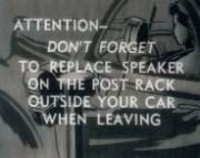 I recall many things about drive-in theaters. But my earliest recollections of going to the drive-in are of oppressively hot Georgia nights, with my Mother and one of her sisters in the front seat, and several of us kids stuck in the back seat, craving more popcorn, trying to sleep, or at least sit still... needing to go to the restroom... trying to endure the inevitable growing pain and cramps in my leg... occasionally glancing at the black and white movie through a bug-stained windshield... trying not to fidget and make noise, while the grownups somehow seemed to actually enjoy the never-ending sappy love story that always starred Van Johnson and June Allyson, or Clark Gable and Lana Turner, projected (slightly out of focus) on the giant outdoor screen, with dialogue barely discernible through a scratchy little speaker hung on the side window. I'm pretty sure I remember..... even as a very young child..... thinking, "this is no way to watch a movie!" But my Mother, and her sisters, had found a way to go to the movies -- with all the kids -- and I'm sure that was a good thing for them. 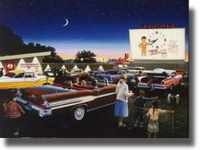 The first drive-in opened on June 6, 1933 in Camden, New Jersey, and over the next quarter century, they popped up everywhere -- peaking at around 5,000 by the late 1950s. Then came a rapid decline. I fear it won't be long before the only title you'll see advertised on the marquee will be "Closed For Good".